Rebecca is a primary school teacher and the driving force behind Jacob’s Ladder Productions. She is a keen musician with a passion for writing and sharing music, particularly with children. She believes music offers huge pleasure and enjoyment and provides a powerful means of encouraging cooperation and inclusion, celebrating diversity and building self-esteem. Since qualifying as a teacher ten years ago Rebecca has delivered the music curriculum across the primary school and established two award winning choirs for children aged 5 to 11. 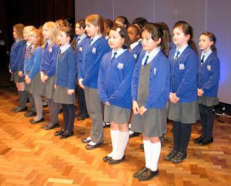 Signed song has become very popular in the last few years and many schools, including the school where Rebecca teaches, now have signing choirs. Combining sign and song enhances the experience of all participants and allows young people who have limited language and communication skills to reap the emotional & creative benefits that arise through the fusion of singing and signing. An increasing number of mainstream schools also use Makaton within their setting on a daily basis where there are children with English as an additional language, where signs and symbols can act as a common thread between languages. The use of Makaton can encourage a sense of community, allowing all children to communicate with each other. With this in mind many of Rebecca’s songs and music resources include Makaton signing. This is something Rebecca feels particularly passionate about as her son Jacob has Down’s Syndrome and has used Makaton from a very early age. Using Makaton provides a truly unique experience for performers and audiences alike so if you haven’t tried it yet, why not give it a go!